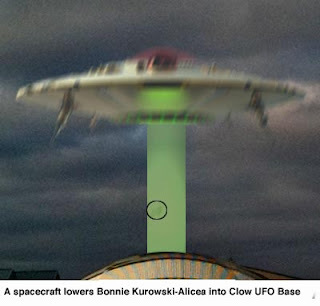 What was planned as a town hall style forum about Clow UFO base turned into a bitter debate between Mayor Roger Claar, and Bonnie Kurowski-Alicea. Though originally planned as a question and answer session with Claar only, many of Clow’s staff and resident aliens demanded that Kurowski-Alicea be brought in as an equal presenter. Ciurkolt started the forum by asking Claar and Kurowski-Alicea to describe their backgrounds. Claar talked about his public history, then told the story about how then trustee Ed Rosenthal introduced him to the aliens at Clow. Claar added that even though he helped drive Mayor Rosenthal out of office over the use of expensive wallpaper in the mayor's private bathroom, he will always consider Rosenthal to be his friend. Kurowski-Alicea, making her first public appearance since mid-2009, said that when she was on the Bolingbrook High School basketball team, an old man visited her after a loss. The man, she said, told her that one day a corrupt mayor would run Bolingbrook, and that she would be the only person who could stop him. “I just want to say that I have never publicly questioned her sanity.” Replied Claar. The crowd gasped as Kurowski-Alicea said she supported turning over the UFO Base as well as the airport to private industry. She quickly added that she would still be in control of Clow UFO Base. Kurowski-Alicea then accused Claar of using Clow as a means to extort campaign donations from alien corporations. After rolling his eyes “to clear a spec,” Claar denied that he has ever extorted anyone. Rosenthal then asked Kurowski-Alicea if it was true she had spent the past ten months in a lunar insane asylum. Kurowski-Alicea denied ever being on the moon. Most of the questioners just stated their own opinions about various issues, most were unrelated to Clow. Kauklka, from the Altar Confederation, spent three minutes explaining his opinion about the occupation of Kxu 7, a planet on the other side of the Milky Way. Seconds after the audience said, “Aw,” Kurowski-Alicea screamed that she wasn’t allowed to bring her children to the debate. When told that Claar’s daughter has had a Black Level security clearance since she was 13, Kurowski-Alicea turned towards the monitor and started accusing her of trying to manipulate the audience. The forum ended with Claar walking off stage, and a still screaming Kurowski-Alicea being carried away by four security robots. Zobxli, pundit with the Trax Interstellar News Agency, said it learned a lot about both sides, but felt the debate was missing something.